Credit card interest rates are typically high, and they can make you wary of using your credit card. These high credit card interest rates make it all too easy to lose control of your payments and can often land you in trouble. They can rack up the costs of even the smallest expenses, which means you’ll end up paying a lot more for something as simple as lunch out if you don’t pay your bill in full every month. Before long, you might find that you’re only able to pay the minimum payment at the most every month. High interest rates can begin a vicious cycle that’s often hard to recover from. It could lead you into credit card debt and cause your credit score to suffer. Thankfully, you don’t have suffer through high credit card interest rates. 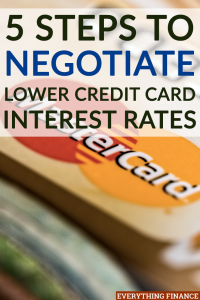 Here are 5 steps you can take to try and negotiate lower credit card interest rates. However if you want to go on the safe side you might want to consider hiring a professional. As you should before you approach any argument or sales pitch, the most important thing you can do is to do ample research beforehand. At the end of the day, your credit card company doesn’t want to lose you as a customer, as it’ll only cost them more money to enlist new ones. That being said, it might be a good idea to look into other companies’ offers as well, to use as leverage in your negotiation for a lower credit card interest rate. Usually, since your company doesn’t want to lose you, they’ll offer to match or get as close to the lower rate as they can. In most cases, the longer you’ve been with an organization, the better your relationship with that company will be. If you’ve just signed up for and received your credit card, it’s unlikely that they’ll be willing to give you any sort of deal or offer to lower your credit card interest rate. However, if you’ve had a company’s credit card for years, you’ve invested valuable time in that relationship and hopefully created a solid relationship with that organization. Loyalty is usually rewarded, so if you can say you’ve stuck with a company, they’ll be more willing to work with you. I don’t mean creating an argument with a customer service representative that leads to your blood pressure rising and you saying angry things. What I mean is if you’re hoping to negotiate for a lower credit card interest rate, you have to create a valid argument for yourself. Take time to carefully consider your habits and credit history before going in to present your case. There are a few elements you should consider and find numbers on to help explain why you deserve a lower interest rate. Again, think about how long you’ve been with that company. Know your card’s credit limit and see how much, if anything, you owe on the card. Furthermore, it might be a good idea to see how much you owe on other credit cards as well, since they’ll all affect your credit score. You should also check back through your statements to see how many times you’ve made a late payment, as that too will affect their evaluation. If overall, what you owe is relatively low compared to your card’s limit and you can say you’ve “paid as agreed” on your cards, your credit score and history should be a green light to a lower interest rate. On the other hand, if you have a less than stellar credit history, there are still arguments you can make as to why you need a lower rate. The best thing you can do if you’re struggling is to be honest with your bank or creditor. Let them know that you run the risk of defaulting on principal. As long as your record isn’t terrible, they will probably work with you. If you default, you’ll be sent to collections, which isn’t good for the company since they’ll make a lot less than they would have. At the end of the day, you have to argue how a lower rate for you is good for the bank as well. It doesn’t help you if you achieve getting a new rate only to find out that it’s still too high for your budget. Before approaching your bank or creditor, take time to figure out exactly what you can afford to pay. Sit down and write out a balance sheet of all your debts and assets. Then take your monthly budget, or create one if you haven’t already. Subtract all expenses from your monthly income, including what you’d pay on a credit card along with the interest paid. Go from there and start lowering rates until you settle on an amount that seems manageable to you. That’s the number you’ll want to present to your bank. Unfortunately, you don’t always succeed the first time you try to negotiate a lower credit card interest rate and the company may very well say no. If that’s the case, don’t bother them to no end, but do be persistent. See if you can speak to someone higher up. By talking to multiple representatives you’re more likely to find someone who will be happy to work with you. Make a few calls over several months to keep yourself on their list. Moreover, if it’s not possible for you to negotiate for a lower interest rate, you might consider another route. Consider a balance transfer to consolidate debt, where you place some of your credit card balance onto another card that has lower rate. Shop around for the best deal of course, and be sure to read the fine print and consider any fees before going with this option. Nonetheless, however, this could be a valid option should your efforts to get a lower credit card interest rate with the company get you nowhere. A high interest rate can make keeping up with payments nearly impossible if you have a large balance. It can start a vicious cycle that forces you to only pay the minimum, and before you know it, could have you getting behind. For the sake of your credit score and to keep your finances a little less stressful, it’s always worth the effort to speak with your card issuer and try for a lower credit card interest rate. Be polite and make your argument. You might be surprised how willing they are to work with you. Have you successfully negotiated for a lower credit card interest rate? If so, what are some of the points you made?